Hardly anyone sends Thank You notes anymore – ESPECIALLY in business. I think it sends such an impactful message when we take just a few minutes to send Thank You notes to our clients and customers (and our personal friends too, for that matter). 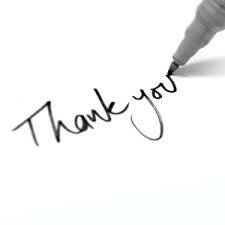 Think about it… when is the last time you received a Thank You note from a place you do business? ….. cricket….. cricket… I bet you were hard pressed to come up with an answer. Most of us can’t think of ANY. But that’s exactly my point… Set yourself apart from the rest of the pack by taking the time and making a small effort to those upon whom your business is dependent… YOUR CUSTOMERS. When to send the Thank You note? Well, first off, you should be sending them to any new customer. Now, this can be difficult for those that are retail or commodity based, but you can still find a way to do this. Pick a dollar amount to be spent that will trigger a Thank You note to be sent. I do a lot of my clothes shopping at Ann Taylor. I don’t shop often, but when I do, I walk out with a few outfits. The manager of the store always sends me a Thank You note. Now, I know she doesn’t send them to every customer, but not every customer spends what I spend the few times I’m in there per year. For those of you in a business model where you have Sales Reps that are charged with forming lasting relationships with new clients, this is a perfect scenario to send a Thank You note to each new client that signs on with your company. It should actually be part of your process. Once the account is signed, the Sales Rep should be sending a personalized handwritten Thank You note (yes, you may have someone with more legible writing pen the note for them/you). But the point is this, I’ve kept all of the notes that I’ve received from Ann Taylor, from Zappos, from Gazelle Sports, from my financial planner, etc. I also make it a point to shop those retailers or providers first when I may have a need for their products or services. The Secret Sauce… But the real secret is to send a Thank You note to your clients and customers when you are not reaching out to them to sell something, check in on their accounts, review something, or anything related to business. When you send a Thank You note out of the blue, the impact is HUGE! In long term contractual relationships, I suggest sending a Thank You note one year after the original contract was signed. Now, your customer doesn’t know that you may have it on your automated calendar to send this out, but they will feel as though you value them. They will appreciate the few minutes you took to acknowledge and thank them for their trust in you and your business. And, when customers feel valued, they’ll repay you with their loyalty. Keep in mind… you likely won’t have many people mentioning to you that they appreciate these notes. But, I promise you it will make a difference in the way they feel about doing business with you. It will strengthen the relationship that you’ve developed with them and will further the sense of confidence they have that they made the right decision in doing business with you. Please comment below on how you’ve appreciated Thank You notes or how you use them in your company.